I started my strength training over this week, since I had completed the 8 weeks. I'm really working on form, and when I can, I add some more weight or do the advanced form of the exercises. My run on Tuesday night didn't go so well. I wasn't feeling great when I woke up, so decided to snooze a bit longer and run after work. I didn't get home until after 8, which meant half of my run was done in the dark. I was ok until mile 4ish when my stomach started giving me some issues. I had to slow down a bit so that I wouldn't puke. I also encountered two coyotes running together. Luckily, they saw me, but kept on running. Phew. The weather wasn't too bad, since the sun had gone down and wasn't beating down on me. Half the time, that's a major downfall, so it was nice not to have to deal with that. Thursday's run felt much better. Cooler weather (mid-70s), but high humidity, so lots of face wiping to stop my eyes from burning from sweat. I managed the 40/30 through the first 4 miles, then needed a few longer walk breaks after that, but mostly kept with the 40/30. Very happy with an average pace under 13:30. 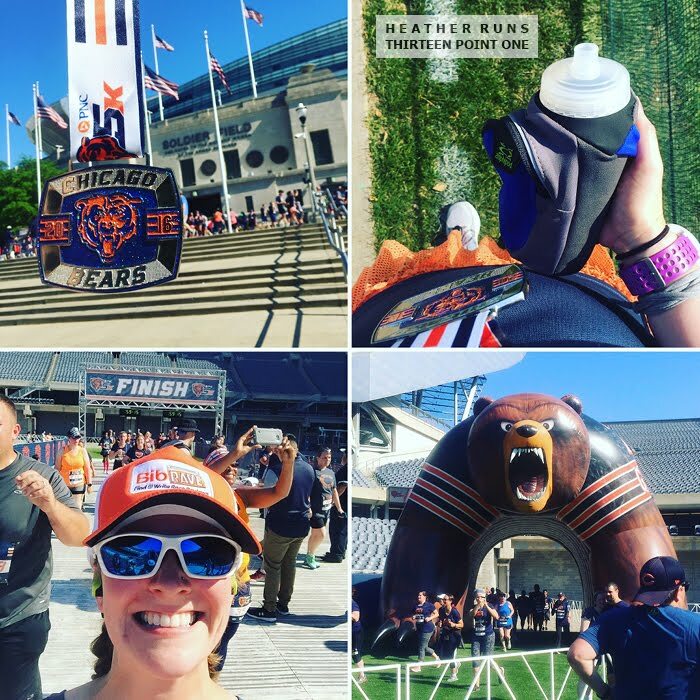 The Chicago Bears 5k was a lot of fun. I wasn't running for time, but running with my mom, taking it easier so that I could save some energy for the 16 miler on Sunday. You can read my BibRave Review of the race here if you're interested. I'll eventually get a recap up on the blog too, but as you can see from my last recap, I'm a few months behind. Hot day, but super cool to finish on the field! Sunday's run was a bit of a tough one. I woke up early so I could start my run before it got crazy hot out. Well, thunderstorms prevented that. I don't mind running in rain, but obviously it's not safe to go out when lightning is in the area. I waited it out, and it finished around 9. The next one wasn't supposed to be until 1, so I figured I should be done before then. The humidity hit me like a wall when I got outside. I knew it would be bad, as our windows were all fogged up. 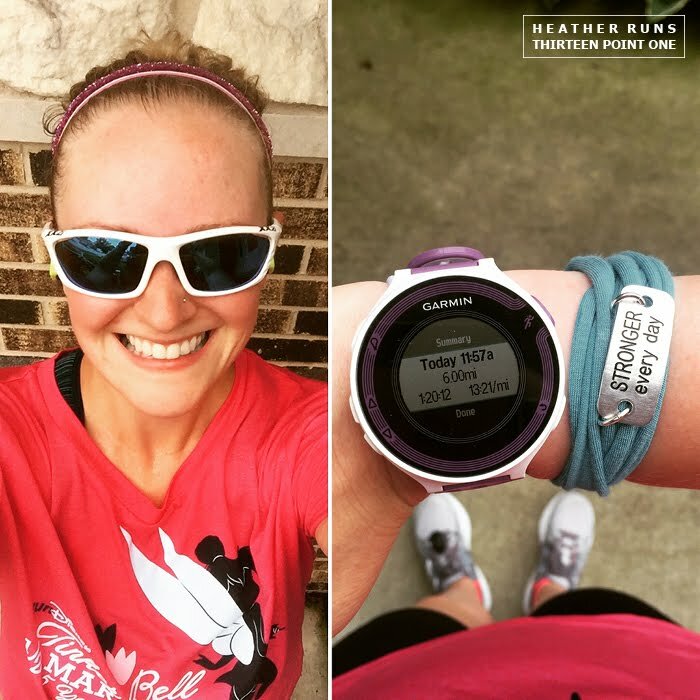 I didn't think I'd make it 3, so was happy that I went to 8 before feeling like I couldn't go any farther outdoors. By this time, it was 90 degrees out with 70% humidity. I did stop briefly at mile 5 to fill up my water bottle and wipe down my face. running out in the open in the middle of the day. Also, super sweaty me. At 8 I stopped home to grab more electrolytes and to head to the gym. I forced myself to run to the gym, hence the other 1.8 miles outside. 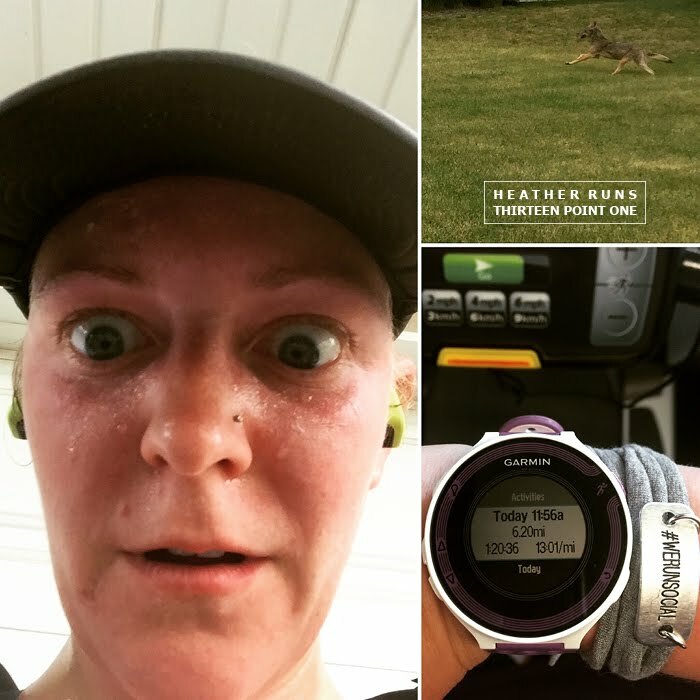 I was annoyed that I had stopped my watch, but impressed with myself for making the decision to run to the gym rather than drive, knowing how hot it was out there. By this time, I was having trouble keeping the 30/30 intervals and found myself walking more. At the gym, I did 60/60 intervals on a 1 incline for 6.2 miles. The towel I used to wipe my face was drenched. I tried new fuel for this run - the Skratch Labs fruit drops. They were really good. Anyway, I then walked home as a cool down. I'll also note that it didn't storm again that day. And for a day that was supposed to be thunderstorms the majority of the day, it was awfully sunny out when I running. Boo. I kept thinking the night before, at least it will be cloudy. And I welcomed rain, just no lightning, since it would have felt oh so good. Oh well, that's Mother Nature. 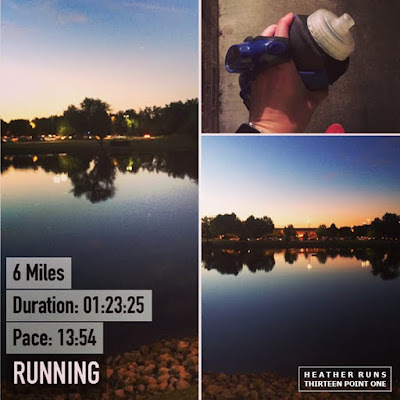 That 16 miler was a doozy – took a lot of mental strength along with physical strength to finish in the heat and humidity, and even though I finished on the treadmill, which I was hoping to avoid, I'm glad I managed to get almost 10 outside before I let myself go indoors to finish, even though I was pooping out sooner. Having to push myself through these conditions will help me come marathon day, especially if it's a hot one like last year. I can tell I'm fairing better than last year, even though running in summer still isn't my favorite thing to do. Seeing improvements in speed through the hot days shows that I'm doing better than last year, so that's a nice reward. *I do my mileage based off of my Garmin. I know the race was 3.1 and not that my watch was off (and the fact there was all the weaving and not running the tangents), but for me to keep track it's just easiest to use my Garmin stats and monthly totals. When adding everything up, I'd forget about the differences and confuse myself haha.